Posted February 8, 2019 by stewartwpboss & filed under Excessive Snoring, Sleep Apnea. Let’s say you stumbled upon our Livonia, MI team as you looked around online, trying to figure out why you’re so sleepy. You know that you’ve been fatigued but you never really considered a sleep disorder before because, well, you don’t even know anything about them. Also, you don’t remember waking up throughout the night, so it never occurred to you. However, upon closer inspection, you realize that maybe this is an avenue worth considering. What to do, you think? Should you call us and come in or will you realize it was a wasted effort? We can assist you in making the final decision in regard to whether you should call! If there’s anyone who witnesses any part of your sleeping, whether it’s a significant other, a roommate or child who could possibly hear you making snoring or choking noises from the other room, etc., then go ahead and ask some questions. Find out if you are making sounds similar to those just mentioned. If so, this is a good sign you may be dealing with a sleep disorder. Just have a feeling that your exhaustion is related to your sleep in some way and that you may have a sleep disorder? Simply interested in learning more, even though you’re not completely sure about symptoms? Come on in! All avenues are always worth exploring. 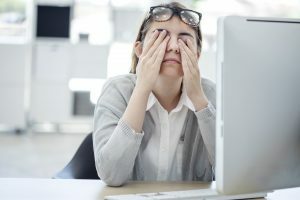 If you are uncertain about your daily exhaustion but you think that your issue may be connected to a sleep disorder, don’t ignore the signs. Instead, take time to schedule a consultation with our friendly team! James Stewart, DDS, and our team serve patients from Livonia, MI, as well as Farmington Hills, Farmington, Plymouth, Northville, Novi, Dearborn Heights, Dearborn, Garden City, Westland, Redford, and the surrounding communities. To schedule a consultation, call our office today at (734) 425-4400.